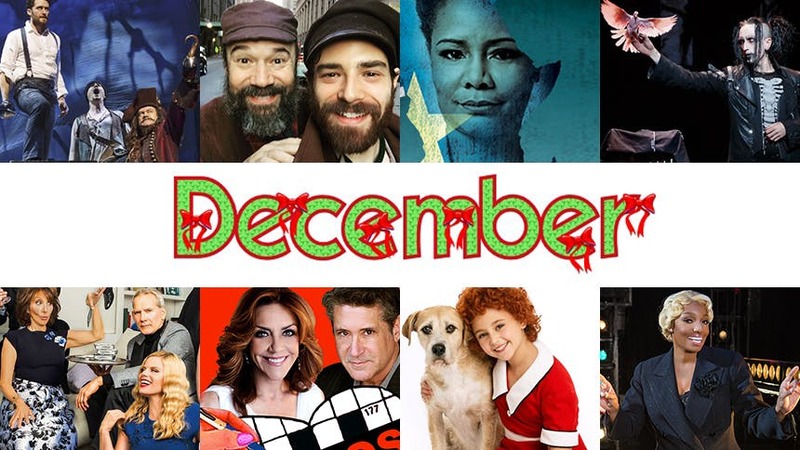 It's December and these are the 10 plays and musicals you want to ask Santa for tickets to see. 1. Looking for a Broadway show that really puts the whole family in the holiday spirit this December? Check out Finding Neverland: it’s big and magical for the kids, it has a beautiful love story for adults, there’s a built-in affinity for the Peter Pan brand, and it’s your final month to see three-time Tony nominee Terrence Mann in the role of Charles Frohman/Captain Hook. 2. Audiences are kvelling after seeing Bart Sher’s three-hanky revival of the Tony-winning classic Fiddler on the Roof. As Tevye the milkman, five-time Tony nominee Danny Burstein is making a convert of anyone who walks in the Broadway Theatre, and newcomer Samantha Massell gives a breakout performance as middle daughter Hodel. Insert some holiday tradition joke and get yourself over to Fiddler. 3. Noises Off, the door-slamming, belly-laughing farce about life backstage in the theatre, returns to Broadway with a cast that is nothing less than an embarrassment of riches. If you are going to only see one play on Broadway this month, make it RTC’s revival of Noises Off. 4. The Illusionists are back on Broadway for a limited run and they changed up the show so even if you saw last year’s run, you’re going to see all-new jaw-dropping feats like the guy who falls onto a spike. 5. It's NeNe Leakes month over Broadway’s Chicago. The Real Housewives, New Normal and Apprentice star returns to Broadway as Matron Mama Morton through December 20, and it’s bound to be a highlight of the month. It’s no secret, Bbox was a fan when she played the stepmother in Cinderella last season, and I legit can’t wait to see her spill the T as Mama in the big Go-to-Hell-Kitty monologue. 6. Tony winner Martin Charnin takes back the reins of his beloved classic Annie as it returns to New York for a limited 16-performance run at the newly restored Kings Theatre in Brooklyn. The musical’s original lyricist and director presents a brand-new production, and word is Lynn Andrews’ Miss Hannigan is pure perfection and shouldn't be missed. Running December 15-27 at Brooklyn’s Kings Theatre. 7. Speaking of Annie, Broadway’s original redheaded orphan, Andrea McArdle, is back on the New York stage in the romantic two-hander 2 Across at off-Broadway’s St. Luke’s Theatre. McArdle stars opposite Kip Gilman in this one-act comedy about two crossword enthusiasts who meet on a train. 8. Tony winner Tonya Pinkins leads Classic Stage Company's revival of Bertolt Brecht’s intense drama Mother Courage and Her Children reimagined and set in a war-torn Congo. And that sentence alone should get you downtown. Performances run December 9-January 24. 9. For all you immersive theatre lovers, there’s a new show in town that you don’t want to miss: Macbeth: Things Bad Begun at Williamsburg’s NY Distilling Company. FoxWolf Productions brings you inside the dark and mysterious world of Shakespeare’s classic with an open bar, live music, and bloody consequences. Running December 7 through December 13. 10. Last call for a bunch of plays and musicals on Broadway, all of which were actually really good. Fool for Love (closing Dec. 13), Dames at Sea (closing Jan. 3), Hand to God (closing Jan. 3), Sylvia (closing Jan. 3), Therese Raquin (closing Jan. 3), The Gin Game (closing Jan. 10), and the Tony-winning Best Musical A Gentleman’s Guide to Love & Murder (closing Jan. 17).